Solid Color Bib Style Pants Buy Now! Looking for lightweight, durable rainsuit pants? 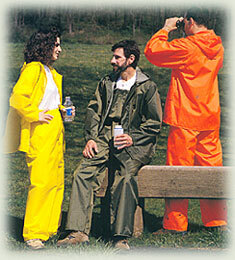 Then check out our bib-style rainsuit pants, specifically engineered for comfort and durability in a variety of outdoor situations. At Kooldri Rainwear, we design our rainsuits and jackets for the serious outdoor enthusiast, one who is likely to use our rainsuits, jackets and other outerwear often. That's why all of our rain gear is made from breathable, porous materials that are both lightweight and durable. We wanted to be certain that you'll not only enjoy wearing your rain wear, you'll wear it over and over for years to come.